A review by Mary Beth Fine, Principal Librarian and Outreach Services Section Manager. Sandberg is the Chief Operating Officer of Facebook, and her resume includes working at World Bank, Treasury Department and Google. This short book (173 pages) was written as a follow up to Sandberg’s talk at the 2010 TED Conference entitled “Why we have too few women leaders” and she continued her “lean in” message at the 2011 commencement address at Barnard College. Both of these talks went viral and created controversy as “the new feminist manifesto” about women in the workplace, and the lack of women in leadership positions. The Hometown section of "The Press of Atlantic City" recently spotlighted the Teen Scene program at Atlantic County Library System’s Galloway Township Branch. More than just a place to do homework and checkout books, teens are recognizing the library as somewhere to gather, meet new people and share ideas. All of our branches provide a safe, educational and entertaining place for teens and we welcome them to come hang out and feel comfortable within our walls. 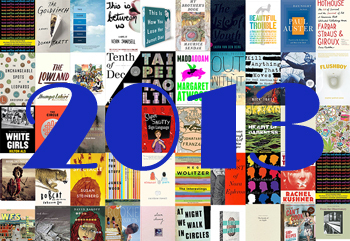 The year brought some great reads by already loved authors as well as authors making their debut and “Best Books of 2013” lists are popping up everywhere. See which of your favorites made the cut and which ones you missed but want to add to your list. Book Review: The Supposition and Uniqueness of "S"
As reviewed by Michael Stirm, a Library Assistant at our Egg Harbor Township Branch. What happens when you put J.J. Abrams, quite possibly this generation’s Steven Spielberg, and Doug Dorst, author, Jeopardy champion, and professor of creative writing at the Texas State University, in a room together? Well, you get S. -- one of the most unique and lovely works of literature that this reader has had the pleasure of experiencing. Unique: S. is unlike anything you’ve probably read before. It comes packaged in a black cover slip with a huge “S”—the signature “S” which appears again and again throughout the book. But S. is not the title of the book…it is the title of the package. The book, just one of 23 literary objects that make up S., is called The Ship of Theseus, supposedly published in 1949 by a supposed V.M. Straka. There is a lot of supposition here, and that’s because—no surprise for fans of Abram’s show, “Lost,”—there is a huge mystery element to S.
Read more about Book Review: The Supposition and Uniqueness of "S"
Open to adults. Registration required. Do you describe yourself as being computer illiterate? Do you feel relatively comfortable using technology, but have specific questions? Offering answers to your general computer questions. Dark film mysteries II [DVD].